Preferred format: This teaching activity is designed for individual students to create the perceptual maps and then for small groups to discuss the interpretation. 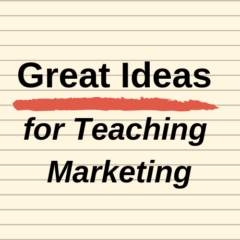 Student audience: Could be run with any level of marketing student, perhaps more suitable for students of introductory marketing as well as students of marketing strategy. Exercise time: Given the students need to develop three different perceptual maps, plus group discussion time, around 20-25 minutes would need to be allocated for this activity. Activity variations: You could get the students to create their own numbers to input (based on research) or add extra competitors. Additional resources: The free download of the Excel template for perceptual mapping is available on another one of my websites, along with a lot of information about interpreting perceptual maps. 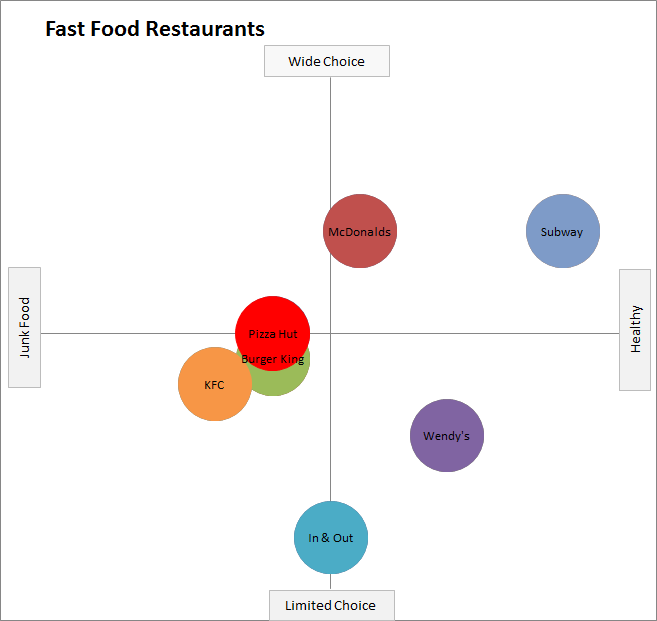 For this marketing exercise you need to create and then interpret three perceptual maps for fast food chains. In order to create the perceptual maps, the easiest and fastest approach is to use the free download of an Excel template for perceptual mapping. Here is the data required to input into the template in order to create your three fast food perceptual maps. Here is an example of the first perceptual map that you need to create to use as a check. Don’t worry about the colors, but the locations/positions of the circles – and the axis labels – should be the same. Recreate the above perceptual map using the above data and attributes. Create two more perceptual maps using the above data – that is, healthy food and adults attribute scores and then wide choice adults attribute scores. By referring to these three perceptual maps, what conclusions can you draw regarding the positions of these competitors in the fast food market? What opportunities exist for repositioning? What opportunities exist for potential new entrants? What other attributes might be worthwhile in plotting onto a perceptual map? Previous Previous post: Is marketing for me?